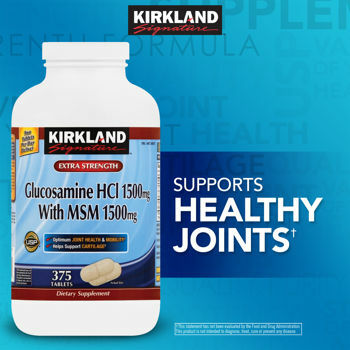 Kirkland Signature™ Extra Strength Glucosamine with MSM - 375 Tablets SALE! SALE! 1-Day only! (Limit 20 bottles per order). Take two tablets daily, or as recommended by a physician. Total Carbohydrate 2 g - 1%, Dietary Fiber 0.5 g - 2%, Protein 0.5 g, Glucosamine HCL 1500 mg - **, MSM (Methylsulfonylmethane) 1500 mg - **. Glucosamine Hydrochloride, Methylsulfonylmethane, Cellulose, Hypromellose, Croscarmellose Sodium, Stearic Acid, Silicon Dioxide, Magnesium Stearate, Corn Starch, Povidone, Polyethylene Glycol. No preservatives added. No lactose. No artificial color or flavor. No gluten. Glucosamine is derived from shellfish. If you are allergic to shellfish, please consult your healthcare professional before taking this product. If pregnant, nursing or taking any medications, consult your healthcare professional before taking this product.